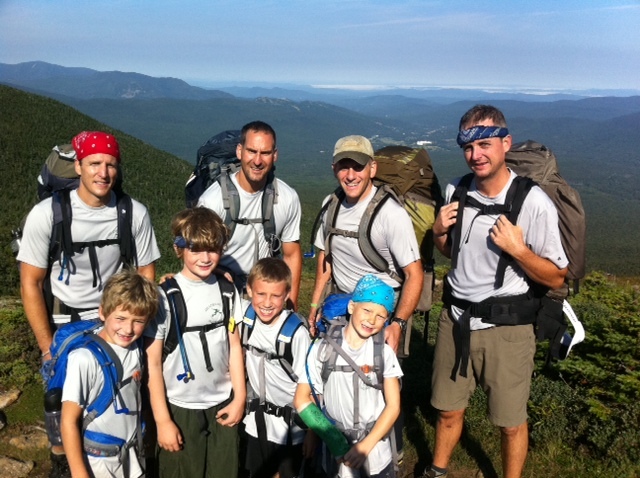 Then she realized that there were eight of them — four dads, four sons, eight T-shirts — and, judging both from the T-shirt maps and the group’s triumphant expressions, one very long hike. Scott Switzer, an AMC member since college, was the mastermind behind “Deathslog 2011.” Last year, when Switzer’s oldest son, Liam, was seven years old, they planned a night at Greenleaf Hut with another father and seven-year-old, Derek and Jett Rosner. The first morning of that hike, the hikers woke to a downpour. Switzer thought, “That’s it. 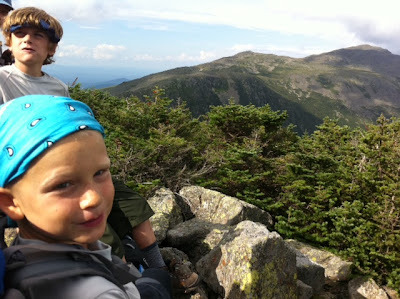 We’re done.” But the boys responded to the rain by saying, “Guess we’re wearing our raincoats.” The day cleared, and fathers and sons made such good time that they ate lunch on the summit of Lafayette and were back to the hut by noon. “The kids ate it up,” says Switzer. Over the winter, Switzer planned another hike, this time in the Presidential Range, extending invitations to other fathers and sons where they lived in West Hartford, Connecticut. A core group of four fathers and four sons emerged. But when Switzer went to make hut reservations in April, he discovered that there was no combination of summer weekends that would allow the group to hike their planned route from Lakes of the Clouds to Madison. There was, however, some room at Mizpah Hut. Switzer did some quick math: The new route would require them to cover 12 miles on Saturday alone. He remembered how bored Liam and Jett had gotten hanging out at Greenleaf Hut the previous summer and how they’d hiked back to the top of Lafayette that afternoon and down again, just for something to do. He factored in that the boys would be one year older in 2011. Then he made the reservations. They organized several spring hikes, including a 12-miler along the Metacomet Trail in Connecticut. To make the hike more challenging, they ran the flat sections, covering the distance in 4½ hours. Switzer held planning sessions and a pre-hike barbeque. On his own, he logged onto the White Mountain Guide Online and fiddled around with a map of their route. When the right weekend in August came around, he stuffed an extra sack into the bottom of his pack. The group stayed close together over the first summits, Pierce, Eisenhower, and Monroe, under clear skies. 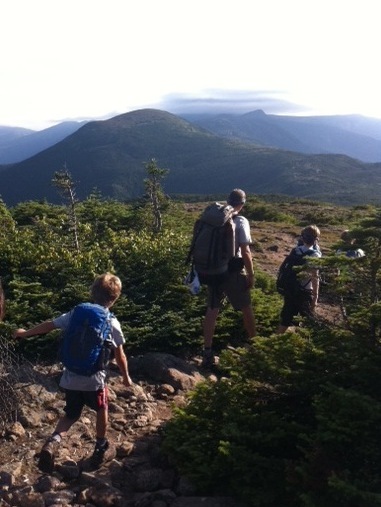 The weather continued to hold, but as the father-son pairs tackled the massive flanks of Mount Washington, they began to spread out. The “no crying” rule began to be honored more in the breach. Ken and Cole Berko welcomed the Switzers to Madison. The first arrivers had worked with the hut croo to save dinner for the rest of the Deathsloggers. Once Liam had collected “about four loaves of fresh bread, an entire pot of lentil soup,” turkey and all the fixings, plus a foot massage, his mood improved. And when the boys saw their beds in Madison’s loft bunkroom, Switzer says, “all was forgotten.” The next morning, all four were ready to hike up Mount Madison and down to Pinkham — and even said they wanted to do the Deathslog again. 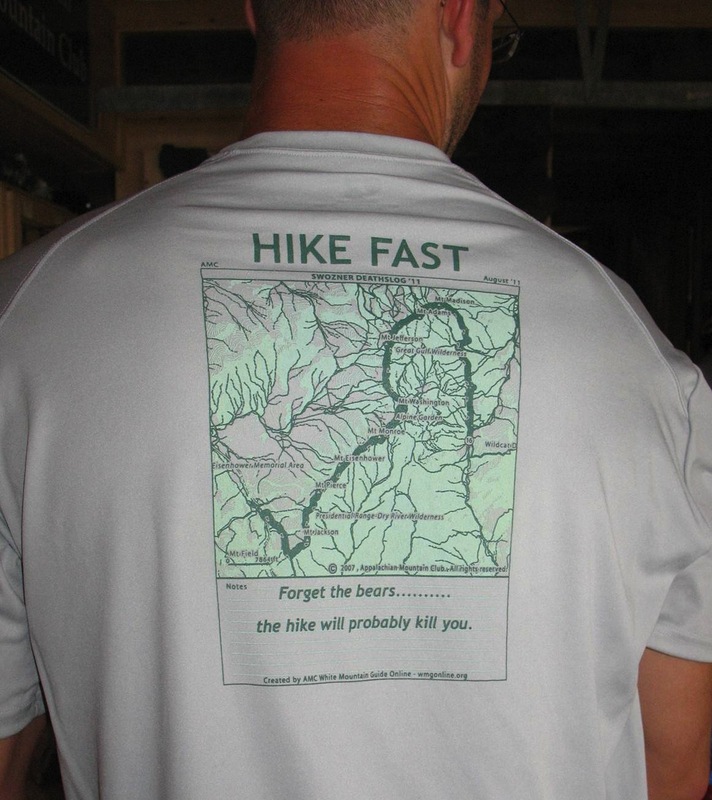 I wonder what the T-shirt will say for that one. -	… about the White Mountain Guide Online. Photos, top to bottom: Ken Berko, modeling the "Deathslog T-shirt. Setting out from Pierce. Deathsloggers on Eisenhower: (back row, L to R) Doug Lubin, Derek Rosner, Scott Switzer, Ken Berko; (front row, L to R) Jack Lubin, Cole Berko, Jett Rosner, Liam Switzer. Liam Switzer and Cole Berko on Jefferson. Courtesy Sam Jamke and Scott Switzer.